Awaiting Ethics Decision On Rangel, A Look At Possible Verdicts : It's All Politics Rep. Charles Rangel, the New York Democrat facing sanctions over an assortment of ethics charges, can receive a penalty that calls for anything between no more than a rebuke or a reprimand to expulsion. I'm sitting here, awaiting the resumption of the ethics inquiry involving Rep. Charles Rangel (D-N.Y.), and watching C-Span's rebroadcast of the July 2002 parting speech of then-Rep. James Traficant, who was convicted on an assortment of corruption charges and expelled from the House on a 420-1 vote (trivia fans: the one dissenter was California's Gary Condit). The Ohio Democrat was a controversial and bombastic figure, and his comments on the House floor were vintage Traficant. There was a bit of bombast this morning from Rangel too, though that ended when he announced he would withdraw from participating in the committee's action. (Having parted ways with his legal team last month -- after spending some $2 million on his defense -- Rangel said he should not have to defend himself without counsel. But the panel investigating his behavior said the Harlem lawmaker had plenty of time to find a lawyer and refused his request to delay the hearing any further (the investigation has been going on for two years). No one is suggesting that Rangel is in any danger of expulsion. A more likely verdict is some sort of reprimand. 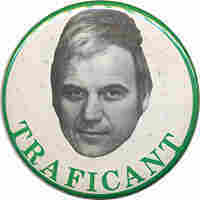 The only reason for the Traficant flashback is because he was the last member of the House to undergo a public "trial." Aside from Traficant, the only member expelled since the Civil War was Michael "Ozzie" Myers, a Pennsylvania Democrat caught in the Abscam scandal in 1980. Less severe is a reprimand. Newt Gingrich (R-Ga.) was reprimanded by the House in 1997 over the way a college course he taught was financed, the first speaker ever to be so sanctioned. (Speaker Jim Wright, a Texas Democrat under fire for his finances, resigned in 1989 before any disciplinary action was taken.) Rep. Barney Frank (D-Mass.) was reprimanded in 1989 for using his office to help a male prostitute. An even milder form of punishment is a rebuke, which is what befell then-Rep. Earl Hilliard (D-Ala.) in 2001 over his misuse of campaign money and then-Rep. Bud Shuster (R-Pa.) over his ties to campaign donors and lobbyists.